My PSR3000 has served me well. But I've decide to try something new. I've just seen a review of the DGX 650 (is there any difference from the DGX660 now on sale?) and I'm impressed. The price at my local store is £629 Which seems reasonable. The only doubt is to whether there is any software or add-ons available. Can my PSR3000 be used as a back up in any way? I looked at the specs of the PSR3000 and quite frankly, except if you want to play more piano music, I don’t think the DGX650 would be a wise move if you liked your PSR3000. Granted, the DGX650 has 88 weighted keys, some cool sounds (the Natural! piano, taken from the higher-end Clavinova’s, is really nice) and decent speakers, but it has only a 6 tracks sequencer with no step sequencing, no onboard style editor, no organ flutes. The styles have only one Intro, one Ending and two Variations. I think that a nice replacement for your PSR3000 would be the PSR S775 or, if budget is an issue, the PSR S670. That said, if you really fell for the DGX650 and want it, by all means try to get the DGX660 instead. 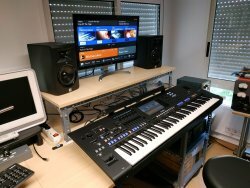 It has more features such has the Piano Room, a mic input with effects, more polyphony etc. I’d say go to the music store and try the PSR S670, the PSR S775 and the DGX660 on top of the DGX 650. If this can help, there are plenty of demonstrations videos of all these keyboards on YouTube. To sum things up, the DGX650/660 is a nice digital piano with limited arranger features so if you want a “real” arranger keyboard, go for the PSR S series instead. What do you mean exactly by using your PSR3000 as a backup? That’s a great summary of the pros and cons for the DGX! The styles have only one Intro, one Ending and two Variations. Actually, you can select between two Intros and two Endings if the style has them (some don’t). The problem is, the panel controls make it awkward to choose which one you want to use, since there are no separate buttons dedicated to each Intro, Fill In, Main, and Ending section as on higher models. You must select the style first, then choose between variation A or B, then choose between Intro or Main, before you start playing the style. As for the Ending, which one gets played is determined by whether you’re transitioning from Main A to Ending or from Main B to Ending, so you might need to do a quick variation change near the end of a measure just before switching to the Ending. The PSR3000 was a great keyboard. If I were you I would go for a ( in mint condition ! ) second hand S910 or S950. To be honest, I'm just assuming that it works the same way as on the PSR-E models-- which don't say anything about it in their manuals, either. My assumption is based on the fact that both the PSR-E/YPT and the DGX/YPG models are XGlite-compatible, have the same configuration of style-related control buttons, and use the same types of style files-- with the exception that the DGX-660 and some earlier models can also play SFF-GE or "SFF2" files (but still only two variations per style). You still have a DGX-6xx keyboard, don't you? Try it and see. If you need a style file that has two Intros and two Endings, I'll see if I can find one to post for you to test with. Having owned a PSR E433 and knowing this “trick” with the 2 Intros/2 Endings, of course I tried it on my DGX650 but to no avail. I’ll try this again when I’ll find a moment and tell you whether it worked or no. And if you send me an external style file I’ll try that to but I seem to recall that the trick only worked with the internal styles of the PSR E4xx. Actually, I don’t particularly need styles with two Intros or two Endings. It is just that if I can access this functionality on the DGX it would be nice to know for which styles there is a choice, because of course this gives more flexibility to play different songs. I have the dgx650 and here is the deal on intros... Yes, there are 2 depending if you select variation A or variation B at the start. However , there is only one ending no matter what variation is chosen. Thanks for the relies. My local store didn't have those that were suggested but the PSR-S775 sparked my interest. I will share my experience... I own a DGX660 and a Genos. They are on different rooms, because for me they have a different use. When I want to play / learn to play piano, I use mostly the DGX660. They keybed is lots closer to a real piano, you have the full 88 keys and the sound with internal speakers is pretty decent. I really seldom use the styles on it, probably because I have the Genos for that, but I find them good enough. Also, the display is useful to show music sheets and the learning possibilities are also good if you need them. It also looks nice and the wooden stand is a plus. I bought it instead of a P125 as it had same keybed, better speakers, more sounds, a larger display, an included support and price was just a bit higher. One point in favour of the DGX660 is its 192 polyphony. There are some iOS apps which work with it, but I still need to explore them in detail. Just to keep you up to date - I finally got a PSR975. I heard it in the store and was very impressed. Congratulations for your purchase and many years of musical enjoyment with your new keyboard. Hello David. That was a very good choice! Congrats! You will never regret it. Great styles on it, and all your styles from the 3000 will sound even better on the 975. The S975 is a great arranger keyboard, light years ahead of the 650 and just a short step under the Genos. Congratulations on your purchase - I'm confident you will absolutely love it as much as you did the PSR-3000.